Biography: Samuel was raised in a Hindu family, but in 1992 Samuel accepted Jesus as his savior. In June of 1996 the Lord called Samuel into full-time ministry and he moved to fulfill God's call on his life. 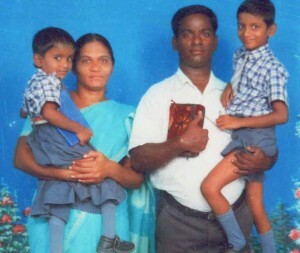 Indian Revival Gospel Ministries began in 1999 with the mission to introduce Lord Jesus Christ to the world. In 2000 Mary joined Samuel in marriage and ministry. Currently besides the home church in Thenabanda Village there are 18 branch churches which are growing and reaching many for Christ. Current activities include Gospel Ministries, church planting, Outreach Clinic, Bible School, helping the needy and Pastor Fellowships. Strengths: Samuel and Mary are very passionate about everything they do for Christ.